We’re setting sail from the Far East on a six month journey to the postseason. Welcome aboard the good ship Opening Day. Pregame ceremonies were lengthy. Reserves for each team were announced by position, followed by managers and starters. I’ll give you one guess for who received the loudest ovation. Hint: He wears high socks and isn’t Thumper. Then came a video presentation on the center field scoreboard honoring several organizations committed to helping Japan rebuild from last year’s devastating earthquake and tsunami. Hillary Clinton cameoed along with Bobby Valentine and several MLB players. Really disappointed with the lack of flyover during the anthem. National anthems were performed by US Army Specialist Amanda Tetreault (accompanied by the US Army Japan Band) and singer/actor Ryotaro Sugi. 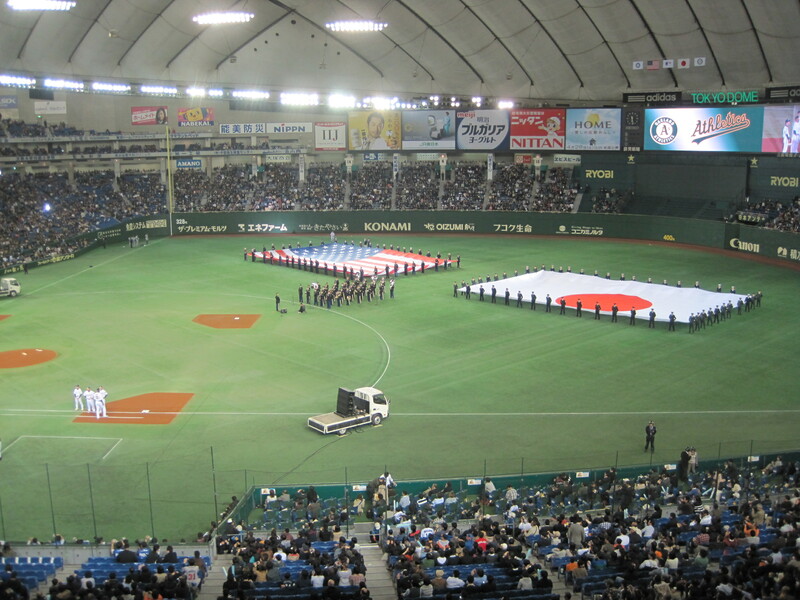 Kimigayo, the Japanese anthem, is short and somewhat somber, especially when sung a capella immediately after the Star Spangled Banner. Sugi was the first male anthem performer this week and sang very slowly, almost speaking the words. It’s possible he’s the Japanese William Shatner. After ceremonial first pitches by three of the tsunami honorees (accompanied by US ambassador to Japan John Roos), the pomp and circumstance exited the field and it was Play Ball for the first time in 152 days. Is that Reggie Jackson? Nope, just an A's fan wearing his flip-down sunglasses from 1983. Never thought I’d say this, but it just doesn’t feel like a baseball game without four trumpets and a drum leading personalized chants from the outfield bleachers. 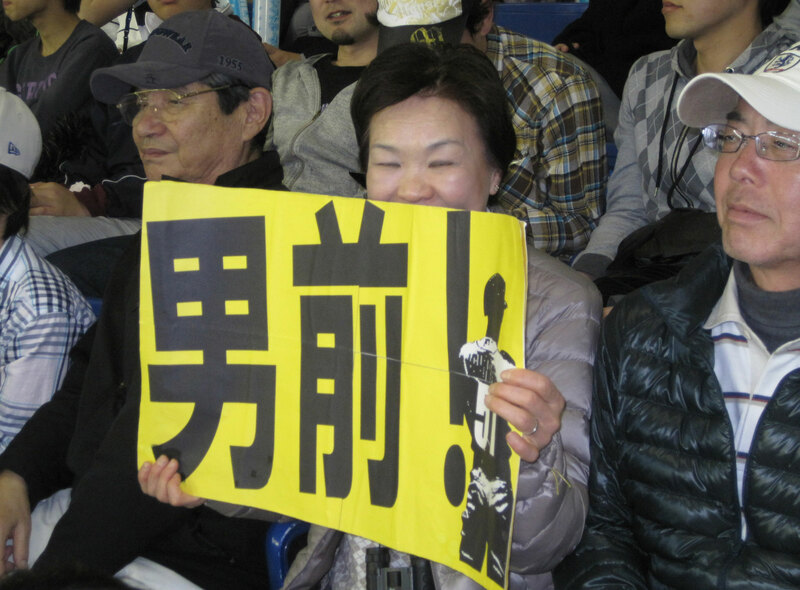 Even sans musical accompaniment, Japanese fans seems hyper-attuned to the game on the field. Even the most mundane of foul pops elicit an “Ooooooooh” from the crowd. Everyone seems on the edge of their seats, but not in a tense way. People just can’t wait to see what happens next. 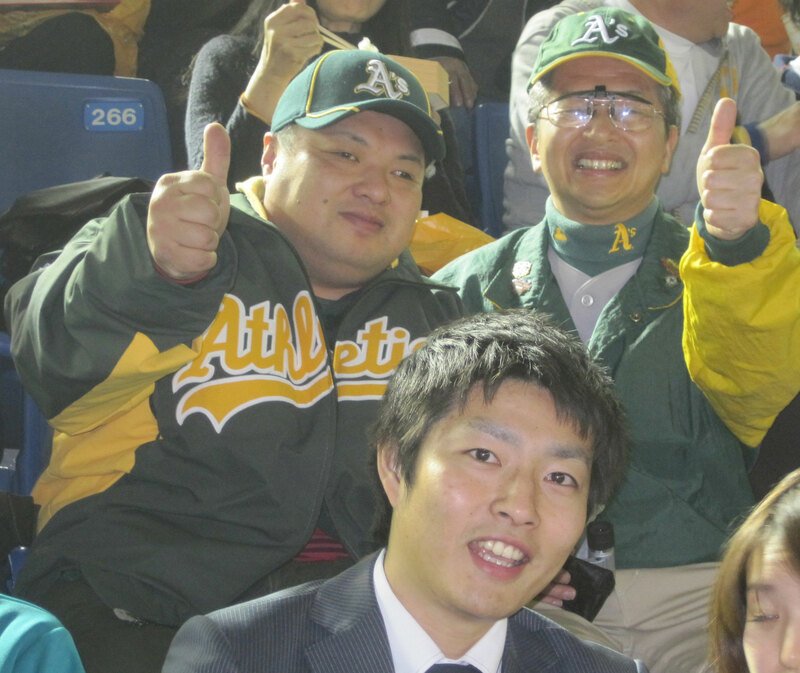 The fans here only get two live Major League games, and they’re going to hang on every second of them. 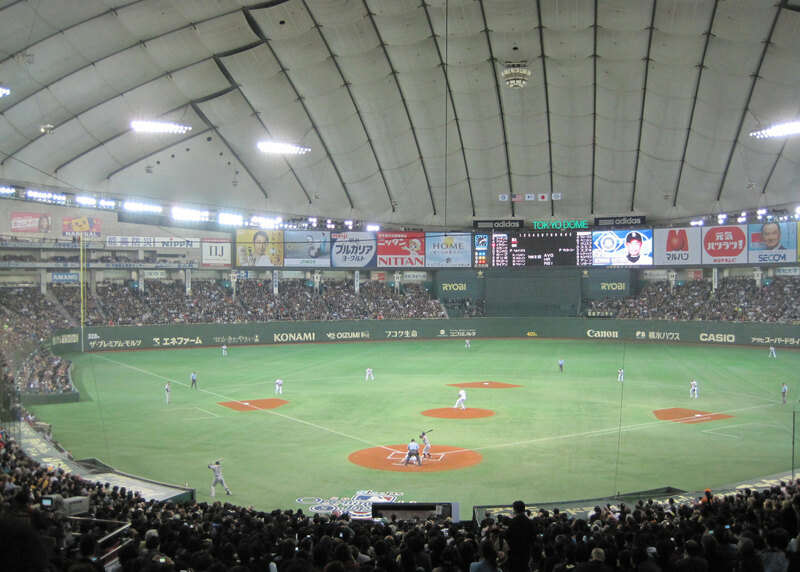 At times, everything else that happens in the Tokyo dome feels like elaborate B-roll for Ichiro’s at-bats. It’s impossible to overstate how much of a centerpiece he is to this whole Opening Series. Of the fans wearing jerseys, probably 75 percent are repping Seattle and 90 percent of those are No. 51. Oh, you were told there would be no math? I’m working with an abacus over here so you’re on your own carrying that four. Anyway, the man is nothing short of a national hero. The only comparison I can come up with: Remember those two weeks during during the Beijing Olympics when Michael Phelps was EVERYWHERE? Leading every conversation, pitching every product — we watched three hours of badminton hosted by Bob Costas to watch him swim for three minutes. Ichiro is like that here, but apparently all the time. So as long as he’s playing for the Mariners — and probably long after — an entire nation will be wearing navy blue and northwest green. BREAKING: As I wrote that last paragraph, Ichiro singled in an insurance run in the top of the 11th, then got caught in a rundown (pickle!) and was tagged out between first and second. The fans gave him a 10-second standing ovation. A standing ovation for an RBI single and a baserunning mistake. They might lay down in front of the plane on Friday to prevent him from leaving. A half-inning after Ichiro’s error, Brandon League whiffed Kurt Suzuki to put Game 1 of the Opening Series in the Gameday archives. 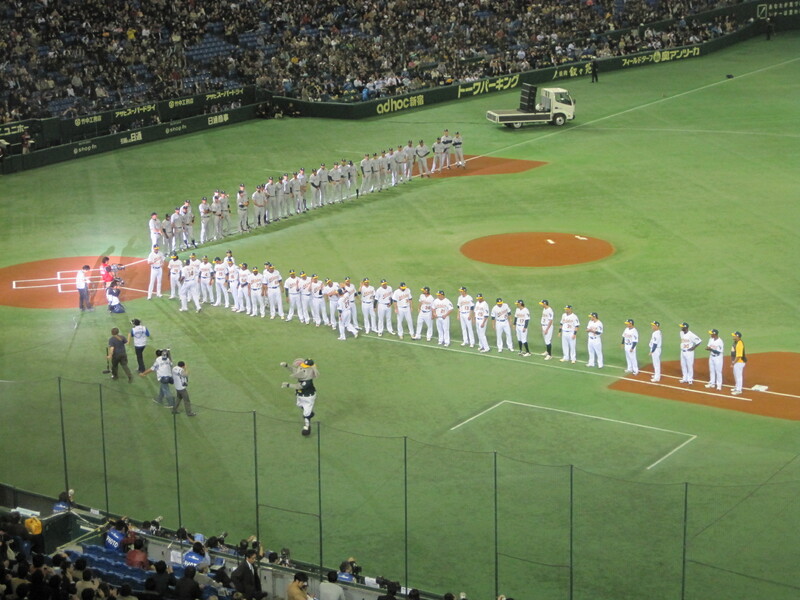 Dustin Ackley was named MVP and awarded a giant check for 1 million yen in a ceremony on the mound. Seattle sits atop the AL West. Oakland sits in the cellar. 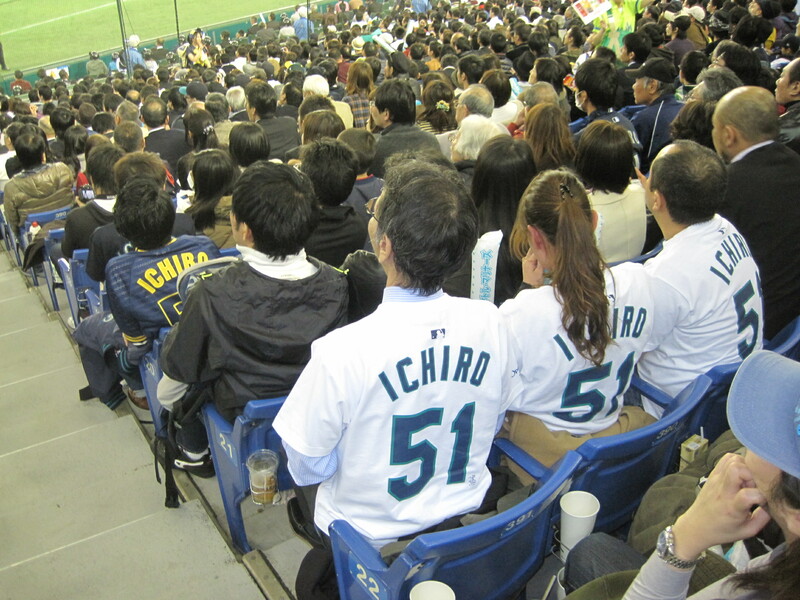 And Ichiro probably sits somewhere at the front of a 10,000-person autograph line. on 15 spot, you should build quality backlinks , it will help you to increase traffic.